Abq Jew Palooza! A Taste of Honey, the Jewish community's annual, exciting, social, cultural, and educational event, is scheduled to take place at the Albuquerque JCC on Sunday, February 9th. Yes, this is Abq Jew Palooza! Event Number 1. Abq Jew has not forgotten Event Number 2 (KlezmerQuerque!). He simply wanted to be sure you have enough time to catch the Early Bird Price! 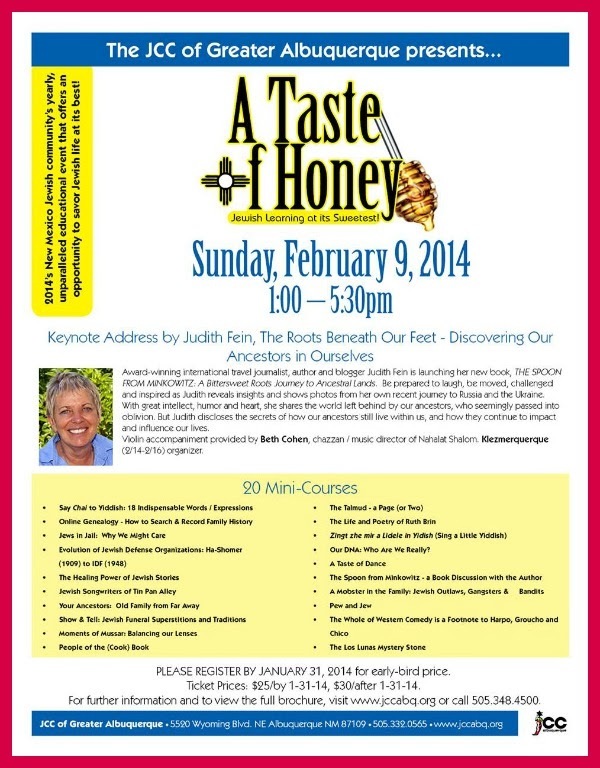 The Keynote Speaker will be Judith Fein. Award-winning international travel journalist, author and blogger Judith Fein is launching her new book, The Spoon from Minkowitz: A Bittersweet Roots Journey to Ancestral Lands. With great intellect, humor and heart, she shares the world left behind by our ancestors, who seemingly passed into oblivion. But Judith discloses the secrets of how our ancestors still live within us, and how they continue to impact and influence our lives. Violin accompaniment provided by Beth Cohen, Chazzan / Music Director of Congregation Nahalat Shalom and KlezmerQuerque! organizer. Dardashti, Schelly Talalay. Our DNA: Who Are We Really? Sokolove, Sam; Barberio, Steve; Kantrowitz, Rabbi Min; Koplik, Sara.